After a day of drinking and wandering around Little Italy, China Town and who else knows where I needed a lot of sleep, or at least I thought I did. I was awake around 8am and feeling surprisingly fresh. It must have been all the water I drank the night before; hydration is key people! I got up, spent an hour or so bumming around the hostel before eventually deciding that I needed a burrito. I’ve got to be honest, there hasn’t been much food-wise that I’ve really taken to while I’ve been in North America but burritos are the best thing, probably. 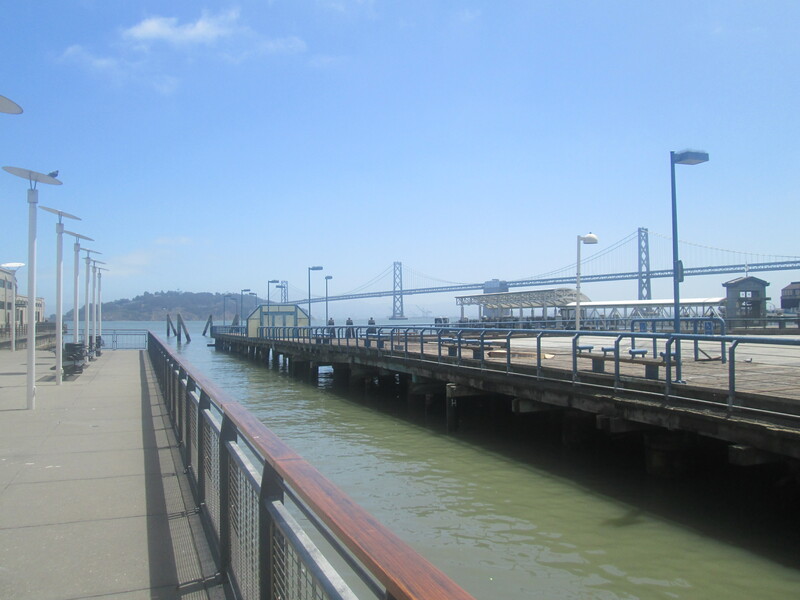 Once I was full I headed down to the waterfront and the piers. Walking out over the water to the end of one, watching people cast their lines into the particularly filthy looking bay. From the end of the pier the view back across the city was pretty good, or at least I thought so at this point. 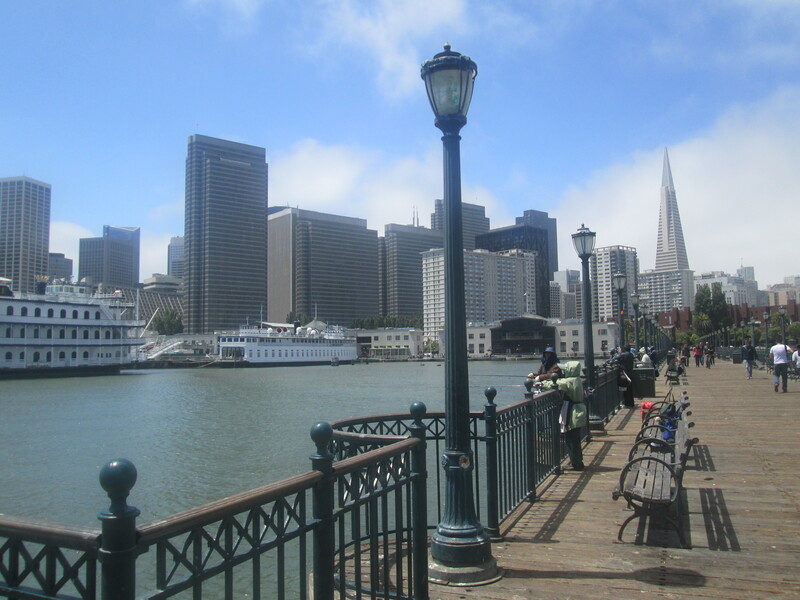 I followed the waterfront round, finding myself at the garish and tacky Pier 39. I walked through, it felt like the place was busy and bustling with every tourist in the city. 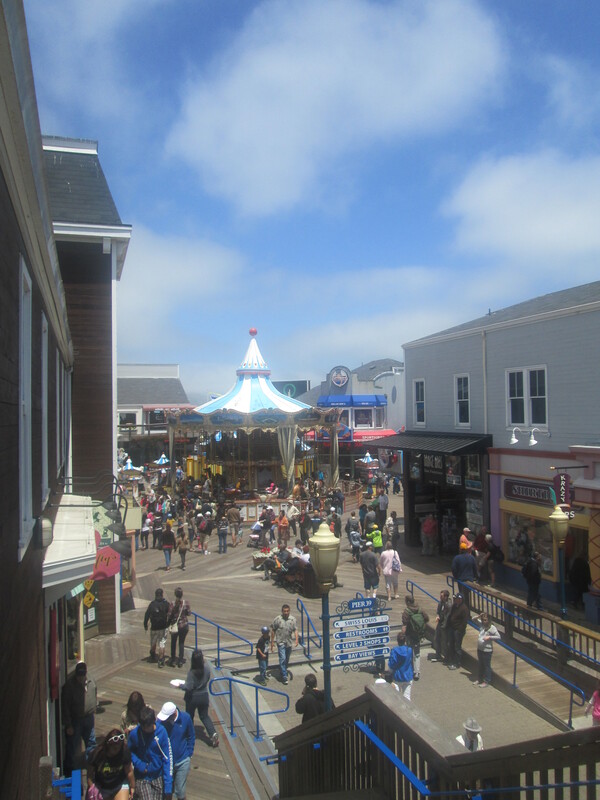 The gift shops and restaurants that line the pier are brightly coloured and fairly expensive, just what you’d expect for a coastal hot spot. 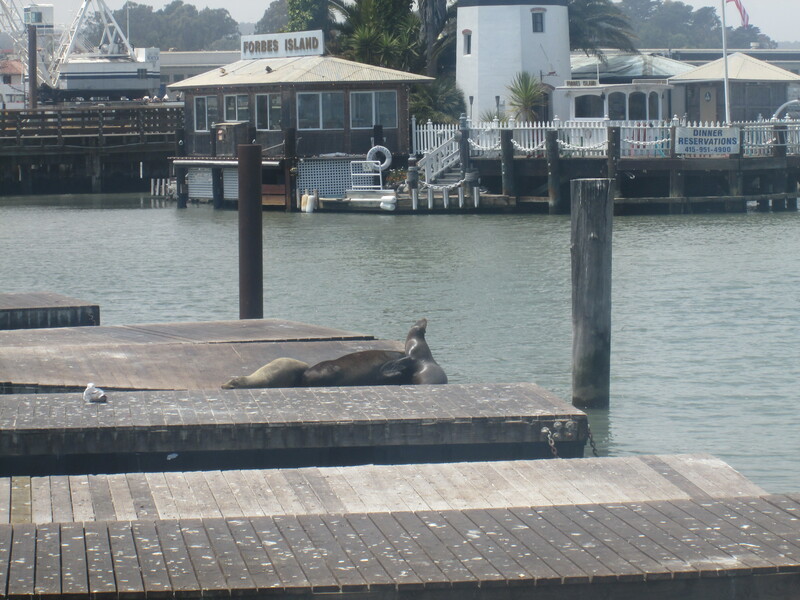 All that aside it’s the place to see the famous bay sea lions. Apparently I was there at the wrong season to see them all battling it out for a good spot as only a small community stay in San Francisco all year round. 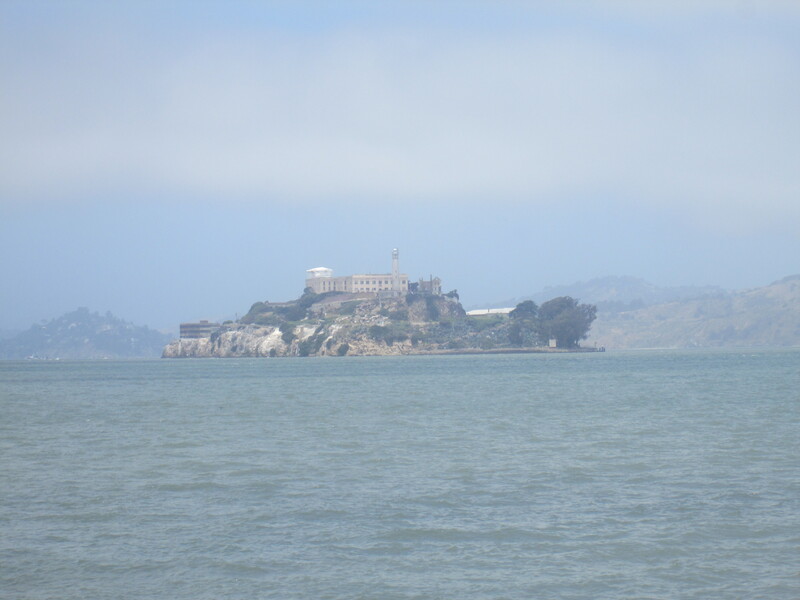 The piers also offer a pretty good view of Alcatraz, I had been tempted to book a tour but on making enquiries I discovered that there’s a two week waiting list. 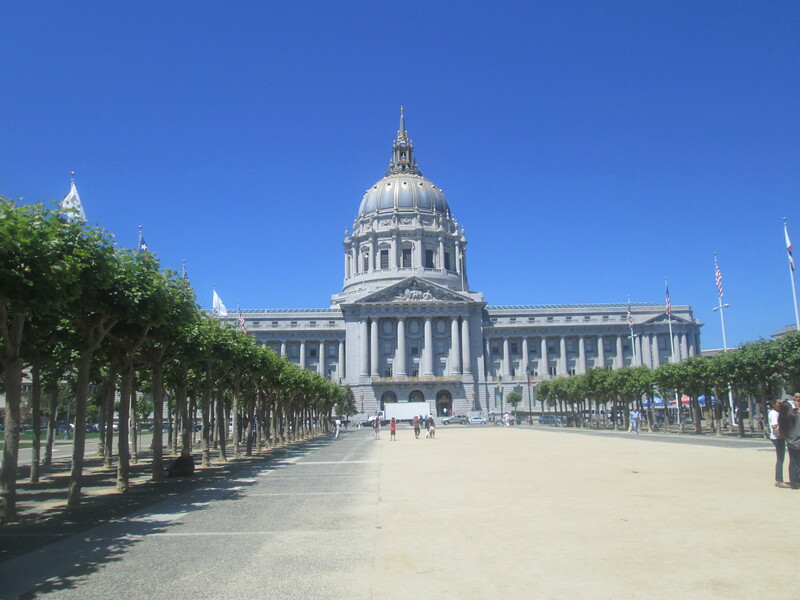 I figured that I’ve been to a prison here and I also had a hot tip that the best part of the tour is looking back on the city from across the bay. No big loss. I continued my walk around, coming to Fisherman’s Wharf and recognizing the place where I had been the night before for soup. It looked a lot different in the day and without the alcoholic haze. 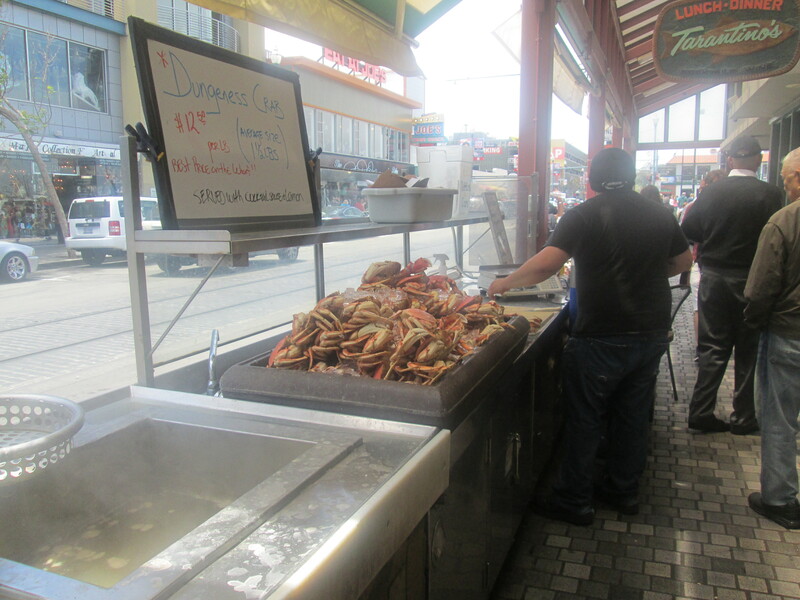 All along Fisherman’s Wharf are places selling all assortments of shellfish in every form you can imagine but the most popular seems to be clam chowder, closely followed by crab. At this point, I realised I could just about see the Golden Gate Bridge off in the distance and naively thought that it was definitely walk able and continued towards it. 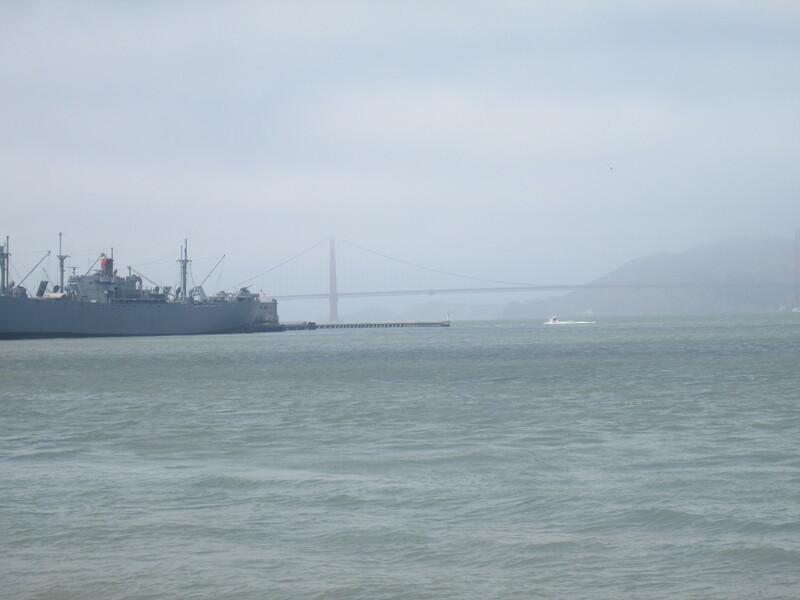 I crossed Fort Mason park and through Crissy Fields before eventually making it to the bridge. 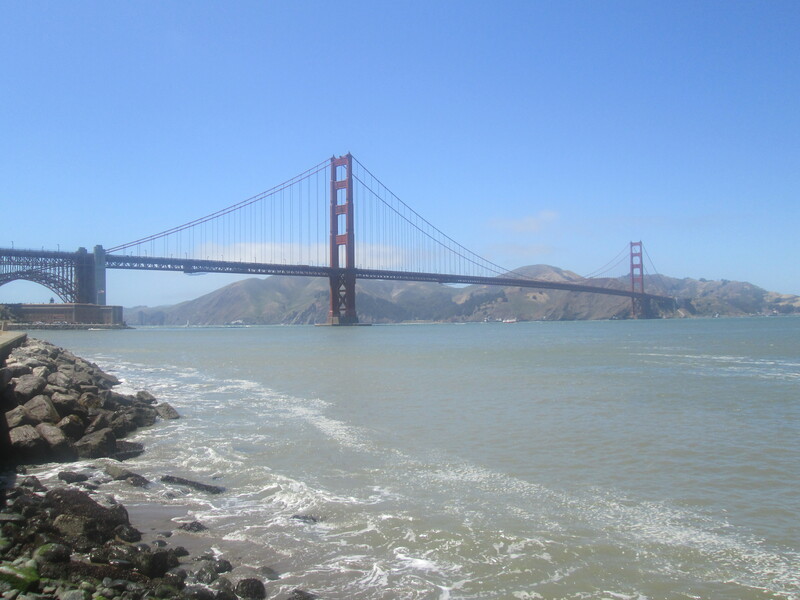 I think that the Golden Gate Bridge might be my personal favourite of the North American land marks that I’ve seen over the past few months. 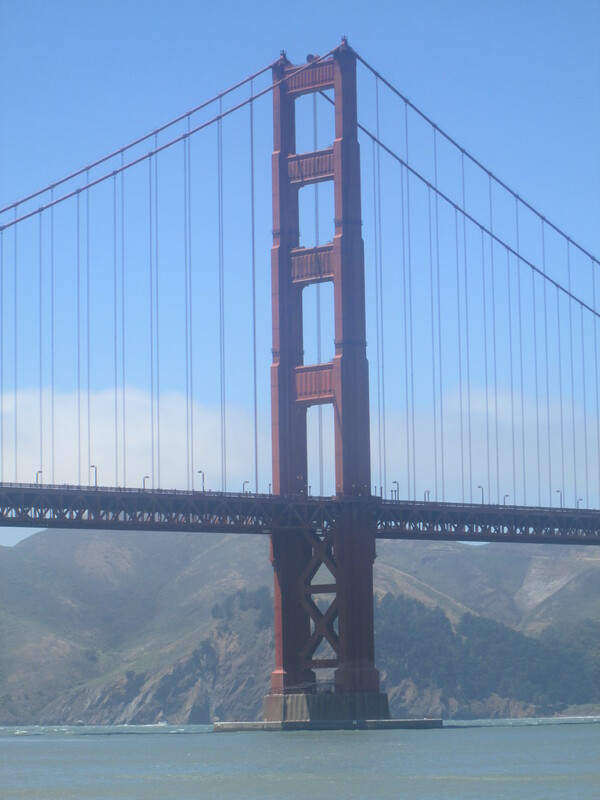 I’m not sure what appeals the most about it, it’s huge and in its day was an incredible feat of engineering. It truly is an icon. 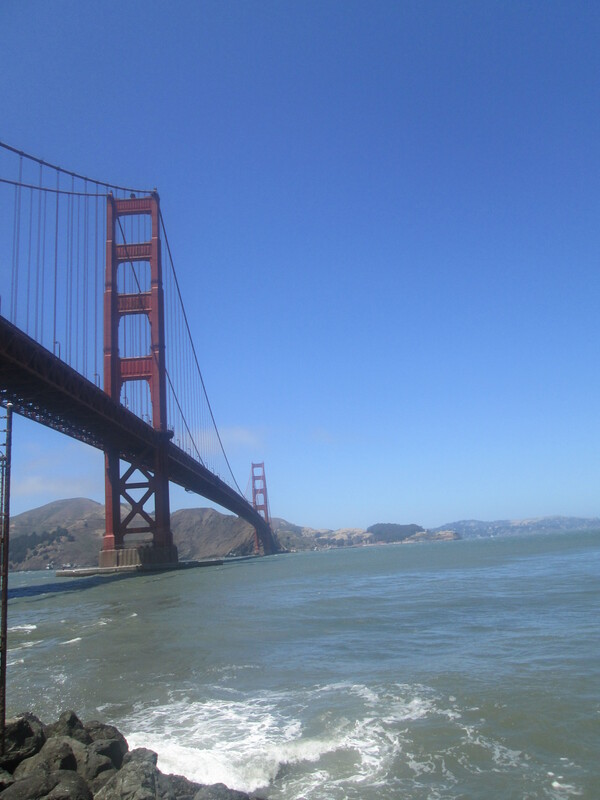 Crossing the bridge is a fairly amazing experience, I started out in shorts and t-shirts and the further out I got the more I began to feel the wind and about halfway I had no choice but to throw on a jacket. 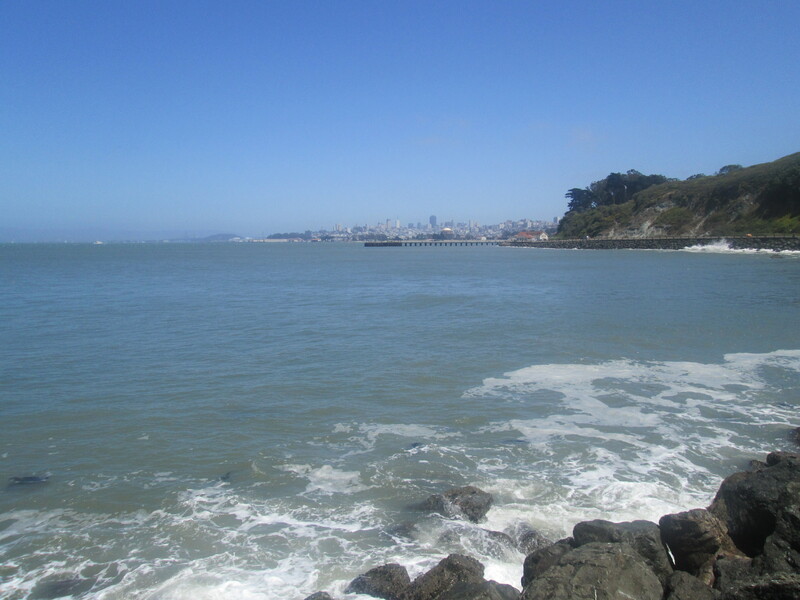 The views back across San Francisco were even better than from the pier. It was amazing. I don’t think my vocabulary is big enough to really describe how much I appreciated being there. After the bridge I figured I’d walked that far, I could definitely make it back to the city by foot. I made it, but my legs haven’t been the same since. It’s definitely possible to walk the city, but the hills are unexpected and are as steep as they look in every film. Once I made it back to the hostel I spent the evening chilling with the guys, after the high alcohol intensity we decided that a quiet night in with a few rounds of Settlers of Catan would be the best way to spend our evening and we played through until the early hours. Need to get myself a copy when I get home! The following morning I had decided to walk down Market Street and take in the neighbourhoods and Mike decided he’d come along as well as he wanted to check out the Civic Centre. At the Civic Centre we came across the City Hall which is an impressive building, similar in style to Washington’s Congress and St Paul’s Cathedral. We walked the length of Market Street passed a lot of the southern neighbourhoods of the city. 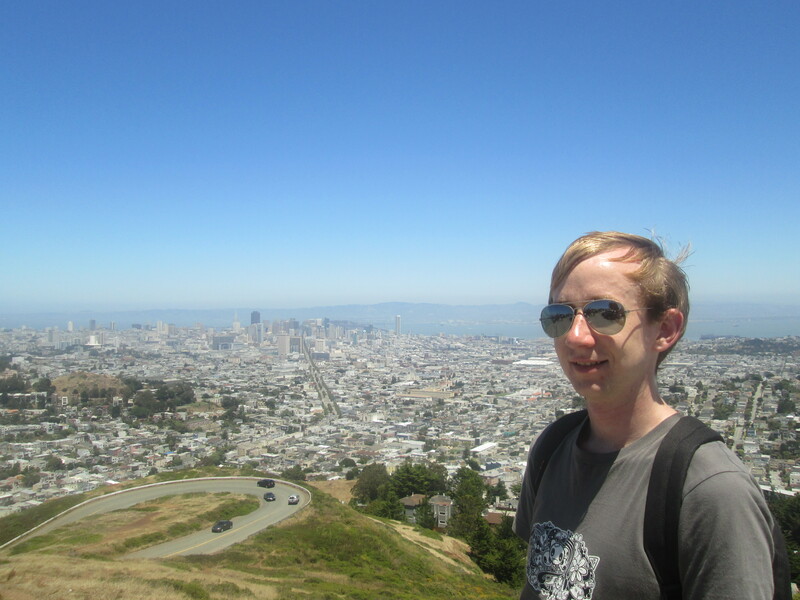 We decided we should try and get up to Twin Peaks as it was marked as a good view point on our map. What our map didn’t show us was how difficult it would be to get up to Twin Peaks, we followed roads, tried to cut through schools and eventually found an old track next to a drainage system and made it to the peaks!